Polbase - Reference: Structure of DNA polymerase beta with a benzo[c]phenanthrene diol epoxide-adducted template exhibits mutagenic features. Structure of DNA polymerase beta with a benzo[c]phenanthrene diol epoxide-adducted template exhibits mutagenic features. 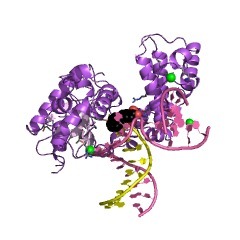 We have determined the crystal structure of the human base excision repair enzyme DNA polymerase beta (Pol beta) in complex with a 1-nt gapped DNA substrate containing a template N2-guanine adduct of the tumorigenic (-)-benzo[c]phenanthrene 4R,3S-diol 2S,1R-epoxide in the gap. Nucleotide insertion opposite this adduct favors incorrect purine nucleotides over the correct dCMP and hence can be mutagenic. The structure reveals that the phenanthrene ring system is stacked with the base pair immediately 3' to the modified guanine, thereby occluding the normal binding site for the correct incoming nucleoside triphosphate. The modified guanine base is displaced downstream and prevents the polymerase from achieving the catalytically competent closed conformation. The incoming nucleotide binding pocket is distorted, and the adducted deoxyguanosine is in a syn conformation, exposing its Hoogsteen edge, which can hydrogen-bond with dATP or dGTP. In a reconstituted base excision repair system, repair of a deaminated cytosine (i.e., uracil) opposite the adducted guanine was dramatically decreased at the Pol beta insertion step, but not blocked. The efficiency of gap-filling dCMP insertion opposite the adduct was diminished by >6 orders of magnitude compared with an unadducted templating guanine. In contrast, significant misinsertion of purine nucleotides (but not dTMP) opposite the adducted guanine was observed. Pol beta also misinserts a purine nucleotide opposite the adduct with ungapped DNA and exhibits limited bypass DNA synthesis. These results indicate that Pol beta-dependent base excision repair of uracil opposite, or replication through, this bulky DNA adduct can be mutagenic.